Georgetown University is a proud participant in the Yellow Ribbon Program in partnership with the Department of Veteran Affairs to enhance financial access for military-connected students. The Yellow Ribbon Program (YRP) is structured to take effect once an eligible participant has met the Post-9/11 private tuition maximum for an academic year. The VA’s academic year is deemed for classes starting on or in between August 1 and July 31. 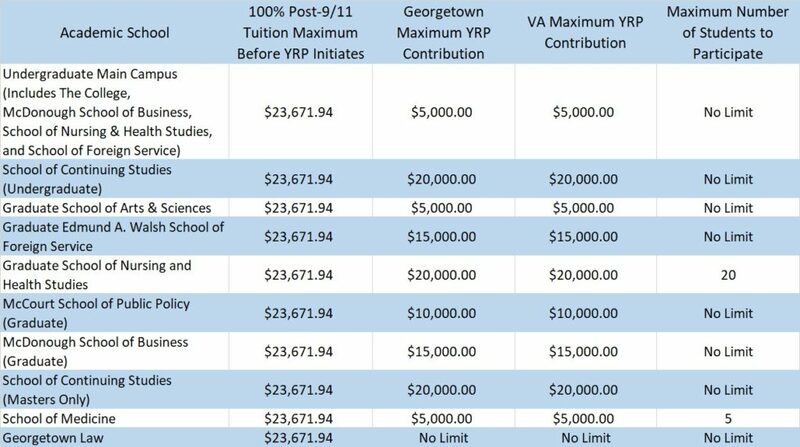 Once the Post-9/11 private tuition maximum has been met, the academic school will contribute YRP funding and is also matched by the VA up to the dollar amount specified by the academic program. Academic schools that have a limit to the number of students who can participate in the program are accepted into the YRP on a first-come-first-serve basis. Any tuition remaining after the Post-9/11 tuition benefit and the YRP benefits have been met for the academic year is the student’s out of pocket expense and is responsible for paying per the Office of Billing and Payment Services policies. The YRP is a year-to-year contract between the VA and Georgetown. Information about the 2018-2019 YRP agreement and how to participate can be found below. Once a student has been accepted to a degree program at Georgetown University on the Main Campus or School of Continuing Studies, students can take the steps below to participate in the YRP. Georgetown Law YRP inquiries and how to apply can be directed to lawreg@law.georgetown.edu and School of Medicine YRP inquiries and how to apply can be directed to Mr. John Hammett. Step 1. Provide a Proof of Benefits indicating that the student is 100% eligible for Post-9/11 benefits and not on active duty or receiving transferred benefits from a spouse on active duty. A proof of benefits includes a Certificate of Eligibility letter or eBenefits screenshot. If providing an eBenefits screenshot it must accompany a copy of the student’s or spouse’s DD-214 (please black out sensitive information). Note: If you are eligible for the Post-9/11 GI Bill at the 100% rate and are not on Active Duty or a Spouse of an Active Duty Service Member using transferred benefits, then you are automatically eligible for the Yellow Ribbon Program and are not required to submit a separate application to the VA. Step 2. Complete the Benefit Request Form each semester. This step is required for all undergraduate and graduate students on the Main Campus and School of Continuing Studies. Step 3. School of Nursing and Health Studies Graduate Students must submit a Request Form for Participation in the 2018-2019 Yellow Ribbon Program. This school has a set number of students who can participate in the program and the YRP Request Form tracks applications on a first-come-first-serve basis. The YRP Request Form is only needed once per academic year. Students will need to be logged into their Georgetown email account and logged out of any other email account to access this form. An academic year are classes that start on or in between August 1 through July 31 and can include the Fall, Spring, and Summer semesters.